A Virginia teenager was rushed to the hospital after touching a giant hogweed plant while working at his summer job. Alex Childress, 17, was working at his landscaping job on Tuesday in the Fredericksburg area when he came across a large plant with white flowers that he believed was a weed. Using loppers, the teen chopped the plant down and threw it into the woods, but the plant brushed across his face as he was discarding it. Several hours later, Childress was at home with what he thought was a bad sunburn. His father Justin Childress walked in and was startled. “I walked inside and Alex, he was like, ‘I got really bad sunburn.’ And Alex doesn’t burn. He tans,” he told the Richmond Times-Dispatch. Pretty soon, the family hopped into the car and rushed Alex to Spotsylvania Regional Medical Center. He was transferred to the burn unit at VCU Medical Center. Turns out, the sap from giant hogweed, an invasive species that’s been spreading across the United States, can cause burns, blisters, and blindness, depending on the amount of contact a person has with the plant. “In brief, the sap prevents your skin from protecting itself from sunlight, which leads to a very bad sunburn. Heat and moisture (sweat or dew) can worsen the skin reaction. The phototoxic reaction can begin as soon as 15 minutes after contact, with sensitivity peak between 30 minutes and two hours after contact,” stated the New York State Department of Environmental Conservation. The plant is often confused with Queen Anne’s lace and cow parsnip, and has been spreading in some areas, but not in Virginia. New appearances have all been traced to plantings by people for decorative purposes, according to state officials. Giant hogweed is a Tier 1 noxious weed classification, meaning it was previously unknown in Virginia. Officials want to eradicate it before it becomes established, and anyone who spots one is urged to report it to a local Virginia Cooperative Extension office or file an online report here. Childress has been released from the burn unit but doctors told him to limit his exposure to the sun and, when he does go outside, to slather sunscreen with high SPF levels. 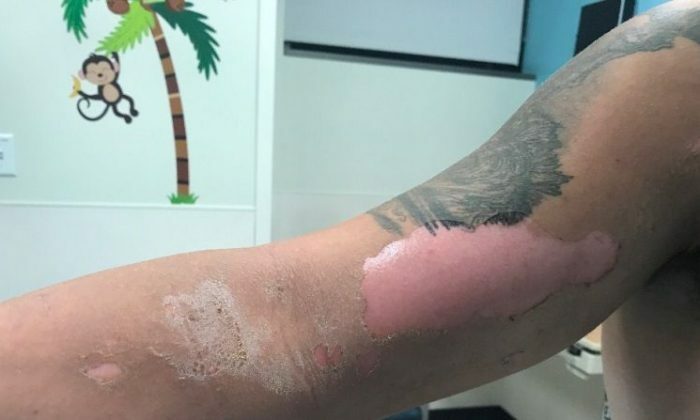 “I still have daily wound care, which requires debriding the burns to remove dead skin,” he said on GoFundMe. Childress is raising money he’ll use at Virginia Tech when he starts in the fall.